Invacare Softform Premier Maxiglide Mattress. The Invacare Softform Premier MaxiGlide Mattress offers the user a new and innovative glide mechanism that significantly reduces shear and friction forces when used with an electric profiling bed. The design of the mattress means that the top surface has excellent pressure reducing properties along with a high level of comfort and support, whilst the base separates to conform to the shape of the bedframe allowing for two independent levels of movement. Pressure reduction is achieved thanks to the deep contoured insert pad constructed from castellated foam cells which moves independently distributing weight and maximising body contact area. All this is contained within a multi stretch cover that shapes to the castellations on the upper surface minimising rucking and further reducing the potential for tissue damage. The cover is vapour permeable and waterproof allowing the release of heat and moisture but preventing the ingress of fluid making it extremely hygienic. Manual handling risks are significantly reduced as this mattress does not require turning. When assessing an individual for a pressure reducing mattress, it is advisable to carry out a risk assessment. The Waterlow scale for example provides a guide category of potential risk for that individual based on the final score. 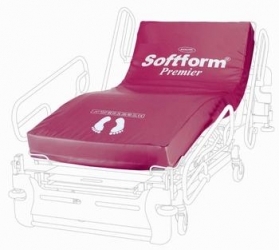 The Invacare Softform Premier MaxiGlide Mattress has a Waterlow Score of 20+ making it suitable for users who are at Very High Risk of developing pressure ulcers. I had a call a day after I placed my order to acknowledge my order which was a nice touch. The delivery took a bit longer than expected, although I was not in a hurry. The only complain is that the delivery driver was extremely rude and just dropped the goods and run away before I had the chance to sign for delivery.